Kuwait is located in the Middle East. Kuwait is bordered by the Persian Gulf to the east, Iraq to the west and north, and Saudi Arabia to the south. 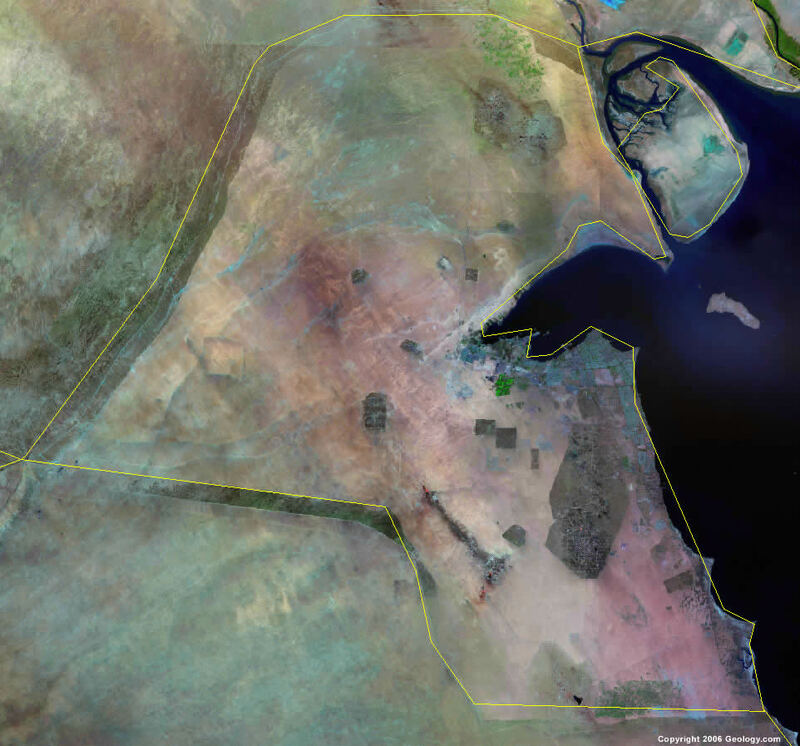 Google Earth is a free program from Google that allows you to explore satellite images showing the cities and landscapes of Kuwait and all of Asia in fantastic detail. It works on your desktop computer, tablet, or mobile phone. The images in many areas are detailed enough that you can see houses, vehicles and even people on a city street. Google Earth is free and easy-to-use. Kuwait is one of nearly 200 countries illustrated on our Blue Ocean Laminated Map of the World. This map shows a combination of political and physical features. It includes country boundaries, major cities, major mountains in shaded relief, ocean depth in blue color gradient, along with many other features. This is a great map for students, schools, offices and anywhere that a nice map of the world is needed for education, display or decor. 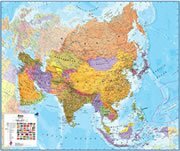 If you are interested in Kuwait and the geography of Asia our large laminated map of Asia might be just what you need. It is a large political map of Asia that also shows many of the continent's physical features in color or shaded relief. Major lakes, rivers,cities, roads, country boundaries, coastlines and surrounding islands are all shown on the map. Abdali, Al Ahmadi, Al Jahra, Al Khiran, Al Kuwayt (Kuwait), Al Wafrah, As Subayhiyah, Ash Shuwayhk, Az Zawr, Bubiyan, Mardaz Hudud al Abdali, Mina' 'Abd Allah and Qasr as Sabiyah. Dijlah (Tigris River), Jun al Kuwayt, Persian Gulf (Arabian Gulf). Kuwait has commercial deposits of fuel which include petroleum and natural gas. Other natural resources include fish and shrimp. Sudden cloudbursts in Kuwait are common from October to April and they bring heavy rain, which can damage roads and houses. Other natural hazards include sandstorms and dust storms that occur throughout the year, although they are most common between March and August. Kuwait has limited natural fresh water resources and water pollution. However, they have some of the world's largest and most sophisticated desalination facilities, which provide much of the country's water. Other environmental issues for Kuwait include air pollution, and desertification.